All submissions to New Voices are peer reviewed by a board of independent academic experts to meet the HERDC requirements for refereed journal status. 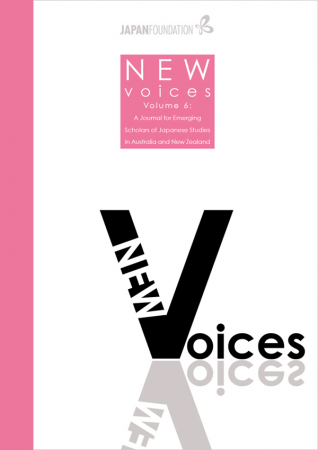 This and other volumes are available for download via the New Voices website and the Directory of Open Access Journals. The views expressed in this journal are those of the authors, and do not necessarily coincide with those of the editors, the members of the Editorial Advisory Board or The Japan Foundation, Sydney. Japanese names are written in first name–surname order, in accordance with English-language convention. The long vowel sound in Japanese is indicated by a macron (e.g. kōtsū), unless in common use without (e.g. Tokyo). All material in New Voices, Volume 6 is copyright. Copyright of the article belongs to the author. Copyright of the collection belongs to The Japan Foundation, Sydney. All third-party images have been reproduced with permission and copyright remains with the original copyright holders. Apart from any fair use as permitted under the Copyright Act 1968, no part of this material may be reproduced without the prior permission of The Japan Foundation, Sydney and other copyright holders.